Maybe it’s the fact that there’s a bit of the old Modern Family poking through lately, or perhaps it’s just a welcome feeling of relief while living through the eternal hellscape that is our current political moment, but there’s something about the life-affirming nature of “In Your Head” that I can’t help but fall for. Much like last week’s episode, there isn’t necessarily a lot of memorable stuff going on in each storyline. Or rather, there’s not much there in terms of any larger arc for the season. These are still just characters going through the motions of their day-to-day lives, and Modern Family seems to have little interest in giving them a new sense of direction or purpose, something more substantial to draw us in emotionally. Normally, that mans the episode flounders. “In Your Head” is an exception though. It feels like the best kind of “hangout” episode, where you just spend some time with the characters that you’ve gotten to know over the years, delighting in their antics rather than finding them obnoxious. Perhaps my enjoyment of the episode comes from the fact that it’s not as mean-spirited as other episodes this season have been; there’s also an absence of the extremely broad comedy that has plagued many of Jay and Gloria’s storylines. It’s more than that though. A slightly cheerier attitude only goes so far, but there’s no denying that the relative optimism that pervades each story here is a factor in the episode’s success. Still, that can’t be enough. What “In Your Head” gets right about the “hangout” episode is the inherently low stakes. There’s no bitter arguments, no sign of characters acting completely outside their normal behavior. Rather, everyone is tuned to just the right wavelength. Jay is obnoxious, yes, but he’s also holding on to a grudge that justifies how livid he is. Claire’s sweetness is evident when she tries to make friends with Shirl (seriously, that’s the name in the credits), the daughter of Jay’s deceased rival Earl. Phil, Manny, and Gloria coming together to look for Luke is strangely sweet, and the least annoying the latter two characters have been all season. Then there’s Mitchell and Cam, at odds all season long, finally taking some time to enjoy their life together at the behest of an intrusive guest they met while in Amsterdam. Such low stakes allow the characters to truly be themselves without veering into that territory where everybody is turned up to 11 and it’s impossible to watch without cringing every few seconds. Instead, it’s enjoyable to watch Manny, Gloria, and Phil go looking for Luke in a “rough neighborhood,” only to find it gentrified in the light of day. “There was jazz,” proclaims Manny, defending himself against his mother’s admonishments. If there’s a storyline that doesn’t quite click, it’s Claire and Jay’s. It has a resolution that’s meant to pull at the heartstrings—Claire perhaps makes a new friend in Shirl, and Jay spreads his deceased friend/enemy’s ashes at the spot where they used to muse on “taking the closet world by storm”—but it’s just not all that compelling to watch Jay and Claire struggle to trust Shirl. Thankfully, there are other storylines to balance out that dud. Manny, Gloria, and Phil’s search certainly relies on some pretty basic comedy, as the gentrified neighborhood boasts four cupcake places—including one for dogs—and an arts collective with your stereotypical hipsters working in the mediums of yarn, Lego, and poetry, but it’s a rather harmless caricature. The people aren’t really the punchlines, and that makes a difference. Instead, Gloria acts as the comedic anchor. Her disbelief at the way the neighborhood has changed—she felt much more at home when it was seedier— is the punchline in every scene. Like just about every other Gloria-centric story, you have to ignore that she’s apparently not all that effected by her super rich lifestyle, but hey, let’s take what we can get with Gloria this season. 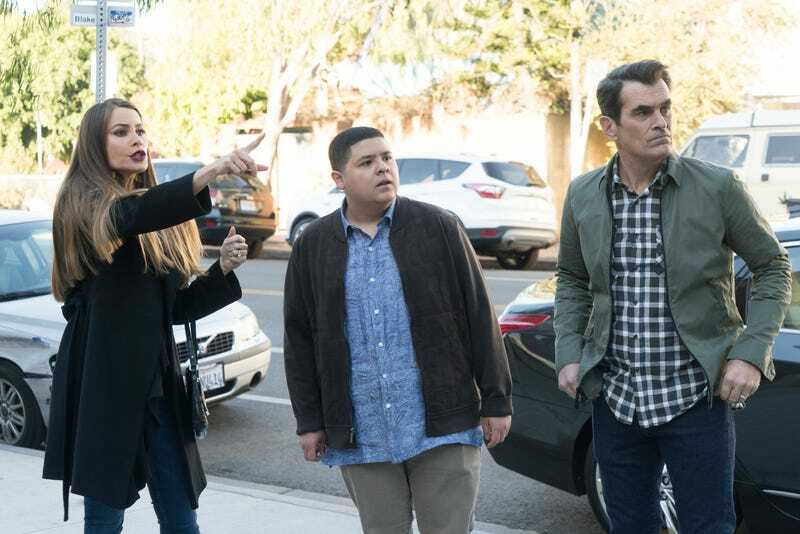 Sofia Vergara and Ty Burrell always play well off each other, and “In Your Head” is no different. The best storyline of the week though belongs to Cam and Mitchell. The idea of them being inspired to be a little more spontaneous isn’t exactly inventive, but it rings true, both in terms of the characters and, I’d wager, the way many of us live our lives in general. When they realize that Max’s criticism about them “deferring enjoyment” in their life is true, they set about correcting themselves. They vow to live life to the fullest. They eat a meal complete with expensive wine, light the monogrammed candle from their wedding that they’d been saving for a special occasion, and decide to finally try out the surfboards they bought long ago. Of course, Cam and Mitchell eventually have to go back to their life, but there’s a lesson in there that still resonates. How many of us think about the things in life we want to enjoy, only to put them off out of fear that we’ll be disappointed? How many of us defer our enjoyment of life because it seems juvenile or irresponsible, or because we think we’ll get to it later? Cam and Mitchell recognize that pattern, and even though it’s just for a day, they break it. Sometimes that’s all it takes to refocus, refresh, and gain a new perspective on the lives we’re leading. Chris Geere is in this episode! And he’s great! The Gwyneth Paltrow-esque lifestyle guru mostly served the purpose of driving me up the wall. I love the beat of Cam saying their wedding candle “smells like eternal love” before accidentally blowing it out.